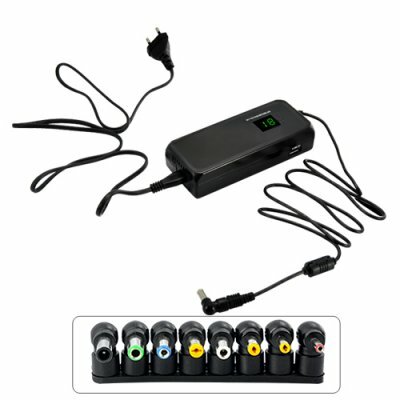 Successfully Added 120W Universal Laptop/Notebook AC Power Adapter with Voltage Selection to your Shopping Cart. 120W Universal Laptop/Notebook AC Power Adapter with Voltage Selection: Charge portable computers with the voltage of your choice! This Universal AC Power Adapter is designed for today's popular laptops and notebooks, which need input from 12 to 24V and output power up to 120W. As a universal device, the adapter works with portable computers that operate across a wide range of power requirements. Best of all, the kit contains 8 interchangeable connectors to fit most famous brands such as Asus, Compaq, Dell, HP, Samsung, Toshiba, and so on. For maximum safety, the voltage of this convenient AC Power Adapter can be set during 30 seconds after plugging it into the power outlet. After 30 seconds the voltage can't be changed anymore unless you unplug the adapter. And to know exactly which voltage you are setting, a mini LCD on the top of adapter indicates it. An easy and foolproof way to keep your laptop or notebook away from damages and troubles! This versatile adapter also has common built-in safety features including overload and overheat protections. So if you need to replace the power brick for your laptop or notebook, then this unit will do the job perfectly while costing much less than OEM models! The 120W Universal AC Power Adapter is in stock now and available for single piece or bulk orders. From the online leader in computer accessories and electronics, Chinavasion. Available voltages are suitable for most laptops/notebooks and LCD monitors. After you plug in the charger to the power outlet, you can set the voltage for 30 seconds. After 30 seconds you cannot change the voltage again unless you unplug the adapter. This is to protect you from damaging your laptop. Included 8 interchangeable connectors fit following brands: Acer, Arima, Asus, BenQ, Compaq, Dell, Delta, Fujitsu, HP, IBM, Lite-On, MSI, NEC, Samsung, Sharp, Sony and Toshiba.